Sleek stainless appliances and shiny granite counters may get all the attention, but the real star in any kitchen is the cabinetry. 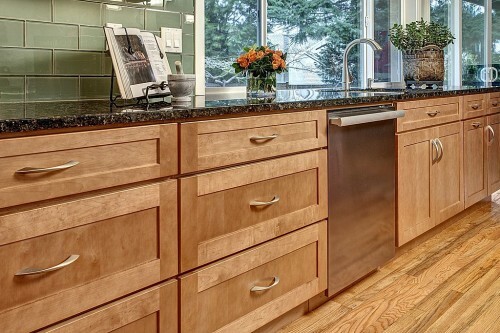 Cabinetry affects the way your kitchen looks, feels and functions. “There’s a huge range in cabinetry today,” said John Morgan, 2013 president of the National Kitchen and Bath Association and owner of Morgan Pinnacle, a Maryland-based manufacturers’ representatives’ agency. “When I started in this business in the early 1990s, you could get oak or maple cabinets in a couple of colors, and your door choices were basically square raised or cathedral. With all those choices at your disposal, it’s important to do your homework before buying what’s often one of the costliest components in a new or remodeled kitchen design. Cabinets, advises Morgan, should be both timeless in their appeal and durable enough to last for decades. “There are absolutely, positively quality cabinets available at every price point,” Morgan said. “It’s like buying a car: It may be possible to find a mid-level Honda that’s got a higher quality rating than a BMW or Mercedes. They’re all quality cars that will get you where you need to go, but their styling and prices are going to vary. When purchasing stained cabinets, be sure to examine the finish closely; a cloudy finish is a tell-tale sign of poor quality. With painted cabinets, ask about the brand of paint and the process. How many coats of paint are the cabinets getting? How are seams being treated? What kind of top seal are the cabinets receiving? A catalytic conversion finish, for example, is a baked-on factory finish that generally outlasts anything that could be applied on site; it’s useful in preventing stains from products such as ketchup and orange juice. Morgan suggests rubbing your hand up and down along the inside edge of the cabinet frame. You’ll want to do this carefully because poorly made cabinets will have sharp edges, and you could end up with a handful of splinters. The inside of the cabinet doesn’t have to feel as smooth as the front, but it shouldn’t be rough or raw looking. While you’re looking inside the cabinets, check the shelves. You want three-quarter-inch plywood or MDF shelves; lesser-quality five-eighths or half-inch particleboard shelves may sag under the weight of heavy dishes and cans. If any part of your cabinetry is going to fail, it will likely be hardware related. When shopping, be sure to check drawer guides, hinges and any other moving parts. Look for brand-name hardware and ask about lifetime guarantees. If something does fail, you’ll want to be able to get a replacement. Morgan prefers drawers that are made with dovetail construction on all four corners, but he notes other construction techniques (mortise and tenon, or glued dowel joints, for instance) are also used in quality cabinets. He suggests pulling a drawer out of the showroom cabinet and turning it upside down. If the bottom is simply pinned or stapled, it’s likely the drawer will fail. Well-built drawers have solid-wood sides and a plywood bottom that fits grooves on four sides. Have more questions about remodeling and womdering what adds the most value to your home? Give us a call, we'd love to answer your questions.